The name of the beer references Detroit’s oldest neighborhood, founded in 1834 by Irish immigrants, while the train conductor on the label pays homage to the city’s iconic Michigan Central Train Station. The coffee glass reinforces the beer’s association with java, while the overall chill, refined vibe speaks to the porter’s more pronounced, refined, mellow flavors. This label represents a slight aesthetic left turn from the post-impressionist color palate—or perhaps a turn south, given its depiction of a horned femme sitting on a barrel. The weizen doppelbock weighs in at 10.5%, pouring a copper red—should you need further indication you’re playing with fire. Hints of van Gogh’s chaos lingers around the edges of this image, apt given the beer’s complexity: the stout delivers tartness, not sweetness, from the cherries, along with notes of toasted, nutty malt. Squint a little, and the dapper gentlemen on right could be William S. Burroughs. But either way, the blue notes and dapper-dressed men with their hats bring to mind the stern authority (and overall M-era aesthetic) typical to Germany, fitting for this German-style pilsner. The French black-and-white-striped shirt definitely echoes Matisse—but it was also once the official uniform of the French Navy, and remains a solid sartorial choice to this day. The visage of this bearded man reflects that he knows this, and that he’s had just the right number of this 6.5% ABV IPA. Atwater Brewery’s logo—a gentleman worker with one arm resting on his hip and the other raising a frothing glass to the world—reinforces the brewery’s association with the working-class origins of Detroit. The labels also came with an industrial sort of simplicity. Bold lines and circles, the brewery’s name in neon sign-like cursive and the city silhouette small and distinct below the apt claim “Bier Is Good.” A timeless message embraced by a brewery founded in 1997. But just because something proves timeless doesn’t mean it’s not ripe for change. 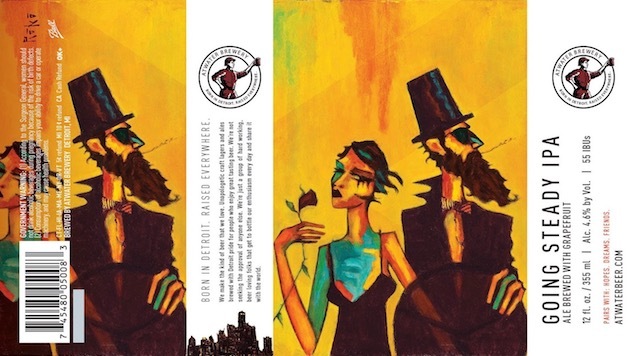 Each label includes a character or two, an effort to personify the flavors of the beer itself, which take most of their direction from older Bohemian beer styles. Roko, however, is firmly rooted in Detroit. As an immigrant from a Roman refugee camp, he started in the city working at the Ford Motor Company, drawing on his breaks until he was recruited to be part of a plant beautification project. That led him to discover materials that could handle the harsh environments of an auto manufacturing plant—industrial coatings, auto enamels, scrap wood from pallets, materials he continues to use today, alongside floor stains, varnish, leftover house paint, and linseed oil, all elements incorporated into original pieces of art that now grace most of Atwater’s bottles. Check out the gallery for some of Atwater’s most intriguing labels.